Once a month, Lindell invites speakers in various fields to impart their knowledge and experience on issues of family and cultural relevance. 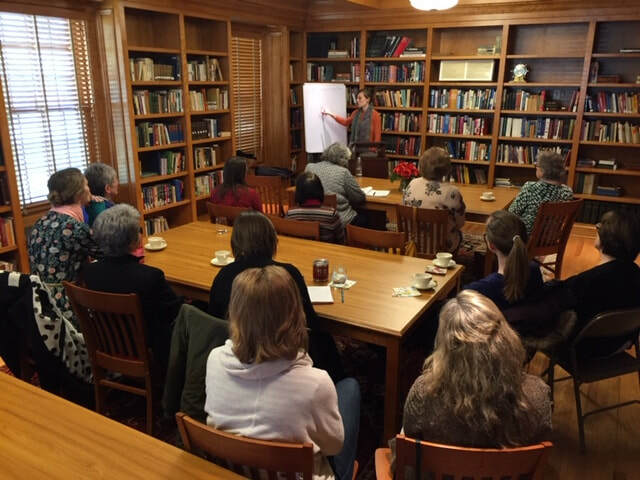 This Women’s Speaker Series is held on Saturdays from 10:00 a.m.-12:00 p.m.
A big thank you to EVA MARIE HAINE and all the BFFs who joined us for the Saturday Seminar on February 9. Eva's presentation on DEEPENING FRIENDSHIPS helped explore philosophical concepts of friendship and practical considerations for making and keeping lifelong relationships. Recollections are a monthly opportunity to reflect on your everyday life in light of basic Christian principles. ​They aim to help you refresh your spirit and strengthen your personal relationship with God. The January 12, 2019 Day of Recollection at Our Lady of Good Counsel in KC, MO has been cancelled due to weather. Join us next month! to reflect on your everyday life and to deepen your personal relationship with God. ​family life and relationships with others, in the light of the basic truths of the Catholic faith. The silent retreat includes times for personal recollection, guided meditations, Holy Mass and confession to offer the quiet we all need to rejuvenate. Cedar Creek Conference Center, 1401 Olive Rd New Haven, MO 63068. The Art of Living is a series of seminars on the art of creating a home that fosters human flourishing.